This cornbread recipe by Meera Sodha offers a tantalising mix of extra mature cheddar with a spicy kick from chilli flakes and hot smoked paprika. Cornbread is ubiquitous in America, but less well-known here in the UK. 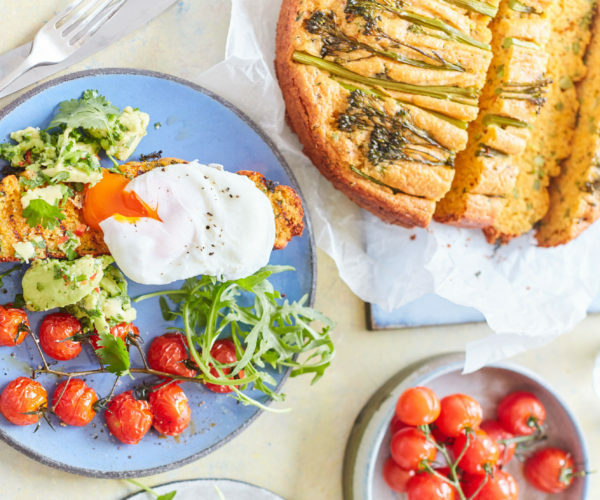 Meera adds, “I think cornbread deserves a better spot in the lime light as it’s endlessly adaptable and can be eaten on its own as a snack or topped with poached egg with some roast tomatoes for breakfast. Pre-heat the oven to 180 degrees and line and grease the cake tin with butter. Place the Tenderstem® into two equal piles. Set the first half to one side, then finely chop the stems and florets of the second half, then place them in a bowl to one side. Place the milk and butter in a small saucepan over a medium heat and stir until the butter has melted then take off the heat. Allow to cool for 10 minutes then beat in the eggs followed by the grated cheddar and yoghurt. Leave to one side. In another bowl combine the flour, polenta, paprika, chilli flakes, baking powder, bicarbonate and salt. Stir everything until evenly combined then slowly add the butter mixture to the dry ingredients, mixing into a batter as you go. Then stir in the finely chopped Tenderstem®. Tip the mixture into a cake tin then smooth the batter with the back of a spoon. Place the remaining Tenderstem® lightly on top of the batter in lines. Lightly brush the stems and florets with oil and place in the oven for 25 mins or a until skewer comes out clean. Leave to cool for a few minutes in the tin then run a knife around the edge of the tin and remove. To serve, cut the cornbread into big thick wedges.